Burma's military government has been officially dissolved, state television said, after the new president of a civilian-led parliament was sworn in. Senior General Than Shwe, who has ruled Burma for the last two decades, has given up his last official role as head of Burma's armed forces. But critics dismiss the new system as a continuation of the old in a new guise. It follows November's elections which were widely criticised by the West and Burmese pro-democracy campaigners. The BBC's South East Asia correspondent Rachel Harvey says the key question is what happens to the all-powerful outgoing head of state, Gen Than Shwe. No-one seriously believes he would voluntarily bow out altogether, our correspondent says. Burmese state TV said Gen Than Shwe had "officially dissolved" the military regime's State Peace and Development Council. "Altogether 58 new cabinet members including the president, two vice-presidents, officials and ministers were sworn in this morning at the Union Parliament" in Naypyidaw, an official was quoted by the AFP news agency as saying. 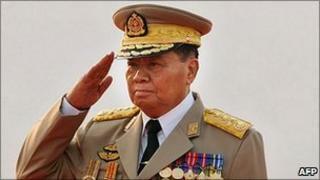 General Min Aung Hlaing has been named the new head of Burma's armed forces. He attended the inauguration of former prime minister Thein Sein - a key Than Shwe ally - as president, an MP at the ceremony told BBC Burmese. The swearing-in of a new parliament completes a transition of power from a military regime to a hybrid administration. Following Burma's first elections in 20 years, it is the final stage in a long road to what the country's military leaders have called a "disciplined democracy". However, critics have labelled the new so-called civilian administration a sham, since it is made up of former generals, some serving military officers and a handful of technocrats. The new President, Thein Sein, served as a prime minister in the old military government, but resigned from the army to stand in the election for the military-backed USDP party. The USDP won 80% of the vote. Under the new constitution, a quarter of seats were also reserved for the military. Aung San Suu Kyi's National League for Democracy - which won the last election in 1990, but was never allowed to take power - is not represented in parliament. The party disbanded ahead of the election because of laws that would have forced it to expel its leaders.